After the release there was an immediate demand for virtual chips. Frankly, the initial demand arose before most anyone would have had a chance to try the thing out the way it was intended--unless they were playing poker with friends the morning of release day. Seriously, TRY IT ONCE with real chips. It's great! Really, it is! This will be optional. I want ot keep the current "real-world chips" option available, becuase that is the way I would want to play if at all possible. Part of what I love about the program (without chips) is the simplicity and style of it. this is going to take some of that away. But I tried to come up with a way of handling chips that would keep with the simplicity and design of what was there as much as possible. The thinking is that it WOULD track turns now. The center board would slide back and forth to handle the 2-sided design. The Chip slider would set the bet ammount and then you would push the stack of chips forward to place the bet. I will try to allow for Limit, Pot-Limit & No-Limit. Pot limit would just say "Pot" where "all-in" is now. Limit may just have a "Call" and "Raise" slider. Again, this is a concept drawing so whatever the final ends up being may look quite different. I'm not sure how this will work for showdowns yet... 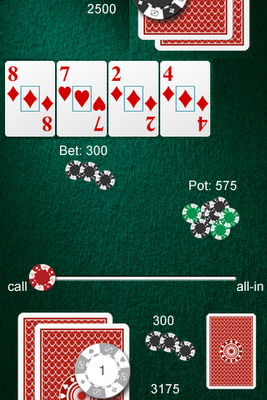 The software may award the pot based on normal poker rules. Which also means building in a hand-reading system. Currently, the software doesn't determine poker hands, it just puts the cards out there and lets you determine them yourself. What adding chips will delay most is the Omaha version! As Omaha has so many more rules for calculating the winning hand. And it would require built-in High/Low support! You'll just have to wait, my fellow Omaha fans. There have also been requests for a single-player version. I don't think this will happen. If it does, that will be an entirely different App--since the underlying program would need to change completely. Anyone know of an open-source poker AI program? Seriously, people: POKER IS A GAME TO BE PLAYED AGAINST OTHER PEOPLE NOT AGAINST A COMPUTER! PS: I placed 3rd at the Tulalip Casino Tournament March 12 for $1100. My first 4-digit poker win ever.